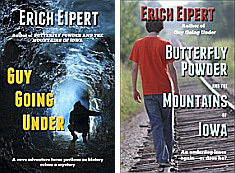 Erich Eipert is the author of historical nonfiction and adventure novels available in ebook and paperback versions. —conditions as of mid-August, 2017. 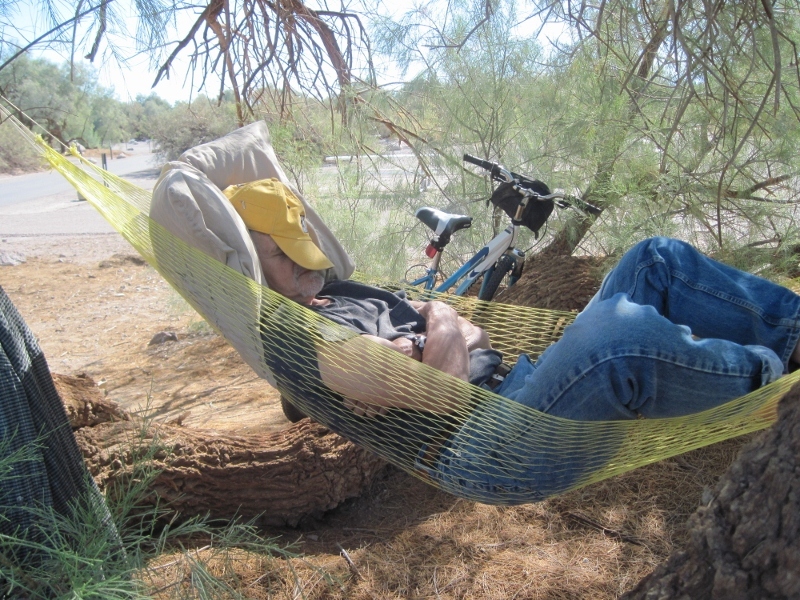 It’s summer and for me, that always means backpacking. This time out it was to an area I’ve visited many times over the last thirty or thirty five years. The section of trail my shoes bit into on August 9 and 10 this year was a continuation of the piece my grandson, my neighbor Barrett, and I, failed to complete last year. That grueling grind year apparently did in Angelo’s backpacking aspirations for a while, and he declined to go this year. But, I hope he’ll return to it someday. My grandson and I on the American Ridge Trail in 2016, with Mt. Rainier in the background. packed steep peak awaiting us on the far side. I recalled have trouble in the same rugged vicinity several years earlier and the trail had deteriorated noticeably since then. We were already parched and because we had no assurance we’d locate the trail ahead, or reach the next water source (Kettle Lake) before we were really in trouble, we turned around. The water issue caused us to descend off trail in the spot the map called Big Basin. We hiked far down and an hour or more later found water in a forest stream, but when we attempted to follow this creek down to BumpingLake to shortcut our way back to the car, we soon learned the terrain ahead was more vertical than horizontal and overgrown with dense, forbidding ground cover. This left little choice but to camp for the night partway back up and in the morning hike out by another route. Me at the War Remnants Museum in Saigon. I’m standing in front of an armored personnel carrier in a courtyard crammed with American equipment. Although Vietnam is still a relatively poor country, Southern Vietnam has clearly prospered since the war when the only real economic engine was Uncle Sam’s aid and GI payday. Ho Chi Minh City, which nearly everyone still calls Saigon, is today busting at the seams with people, shops, restaurants, taxis, buses, and particularly motorbikes. Capitalism, in other words. I was surely not the only visitor to whom it seemed that nearly all of the city’s 11 million inhabitants were out competing for space with taxis and buses on their 7 million motorbikes at all hours of the day and night. Their presence made street crossings daunting. The motorbikes also made it necessary to walk in the street much of the time because the sidewalk space not claimed by outdoor shops and vendors was packed with parked motorbikes. Anyway, I digress. 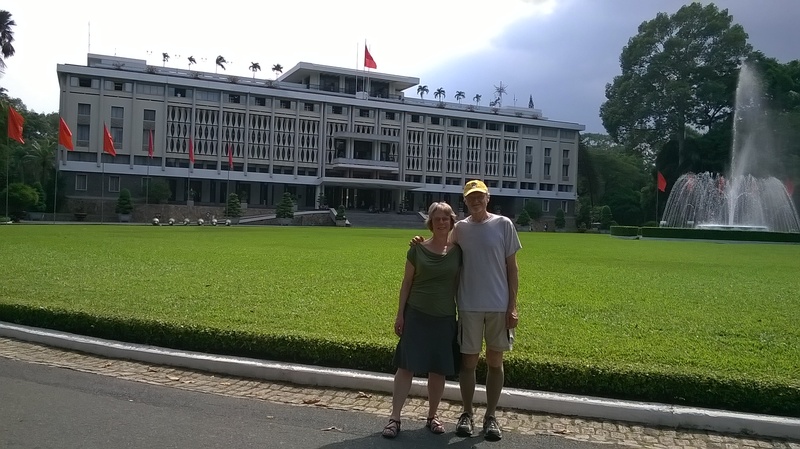 In 1971 I couldn’t have imagined that someday I’d be welcome in the presidential palace in Saigon–a place constantly in the nightly news during the war. World War II is still very much alive in our media and our consciousness, as I’ve noted in recent blog posts. But one of that war’s offspring, the Vietnam War, hasn’t gone away either. 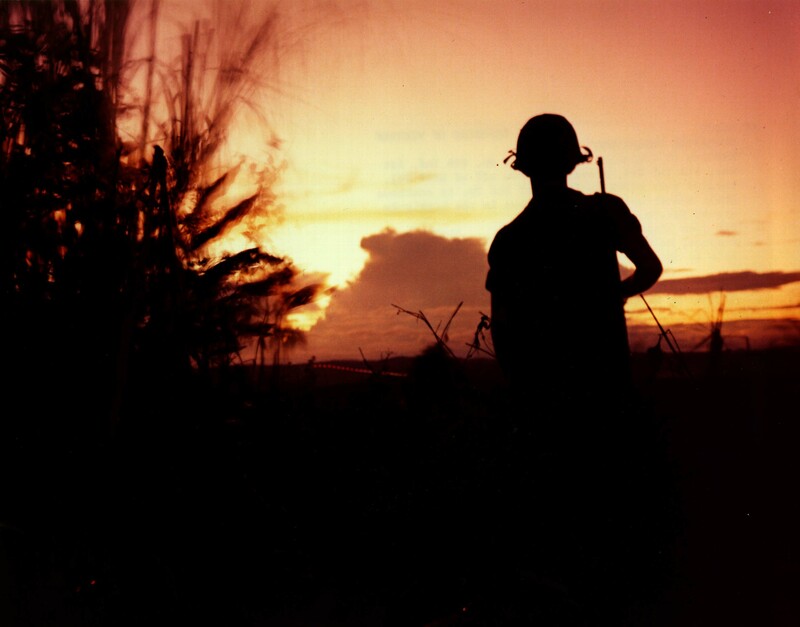 Six decades after it began for Americans, that war too lives on in much the same way. This past April 30 marked an important date in both wars. On that day seventy years ago, in 1945, Hitler killed himself and effectively ended the Second World War. And on that day 40 years ago, in 1975, the North Vietnamese Army took Saigon and ended the divisive Vietnam War. A flurry of news reports and documentaries commemorated the latter anniversary date, but I had time to watch only one. That was because I was about to commemorate the war’s end in a more vivid and personal way. By coincidence, my first return to Vietnam since serving there both in a base camp and as an infantryman occurred just days after this significant date. Who alive in America today hasn’t heard of the Vietnam War or doesn’t know a family it has touched? This conflict dragged on for years and ultimately became very unpopular. Late in the war, returning soldiers like myself were despised by many.When I came back to America in 1971, we soldiers were warned not to wear our uniforms when traveling. 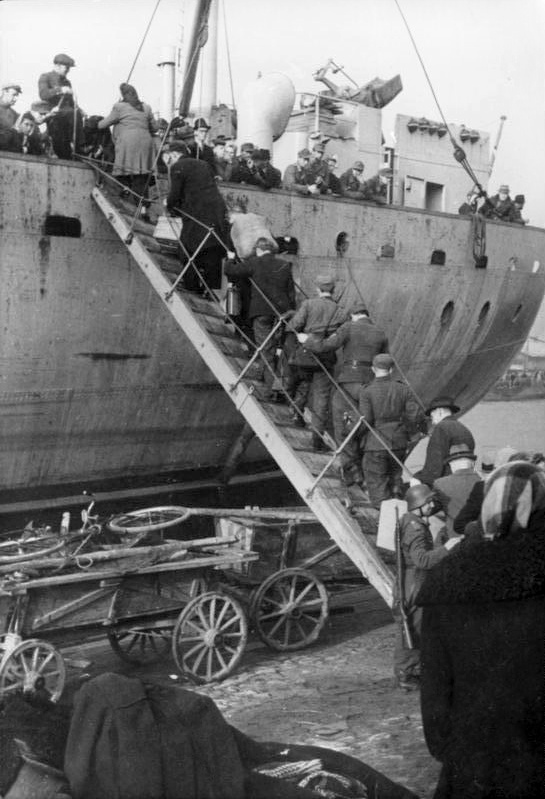 German refugees fleeing Russian onslaught in Kurland, October 1944. Photo from Bundesarchiv. The tragic refugee problem makes headlines every day. 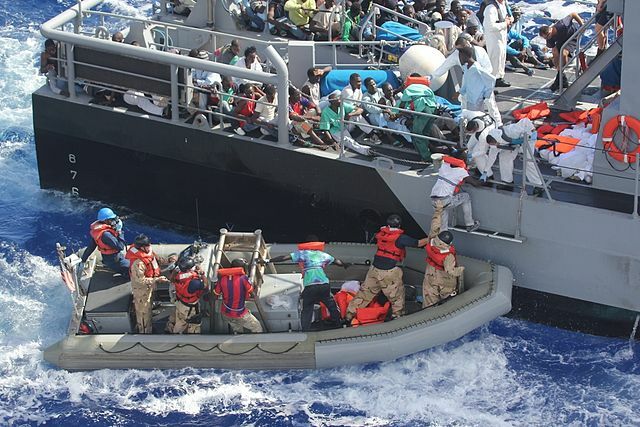 Dramatic photo and video scenes repeatedly show us a mass of impoverished humanity on the move. In many of us fortunate enough to have a permanent home in which we’re viewing or reading these stories, the reports evoke empathy. But in some they also produce indifference, or even outrage. Such people are angered that their country is overwhelmed with migrants. Supporting refugees is never cheap and there can be major social consequences from an influx of people of a different culture and religion. Oskar and Erich at Tomaselli Cafe in Salzburg, June 2015. In The Secret She Carried, an account of two German soldiers meshes with my mother’s story. Oswald Lustig and Oskar Halusa were my Uncle Eduard Hajek’s closest school friends and still teens when they first saw combat. Somehow, both came through the hellish fighting despite multiple life-threatening wounds. Sadly, Eduard didn’t. World War II ended in 1945, or did it? The Death Valley Chuckwalla: They don’t write ‘em like this anymore! Or do they? 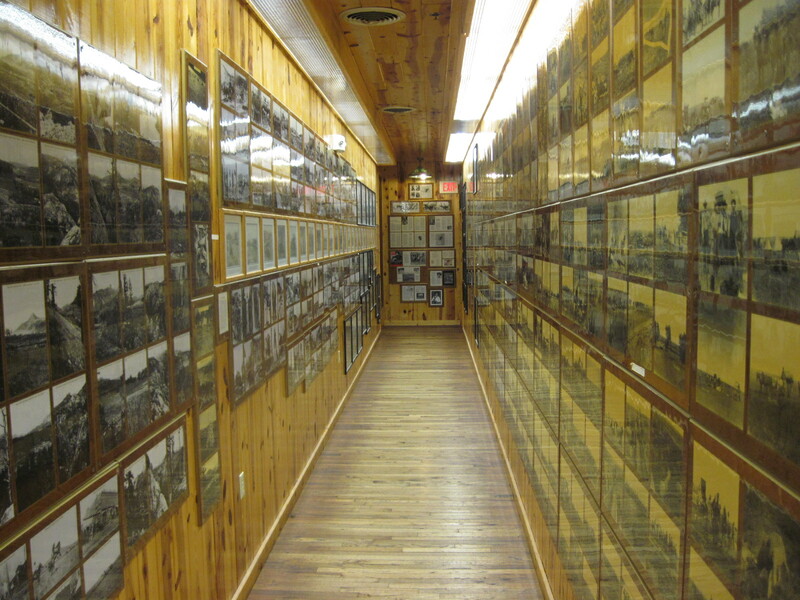 Recently, during my annual camping trip to Death Valley National Park, I found the following description hanging amidst the clutter of photos and other historical items on the wall of the Borax Museum at the Furnace Creek Ranch Resort. Front cover of the Chuckwalla. The newspaper was printed on butcher paper, so the archive copy did not reproduce well. 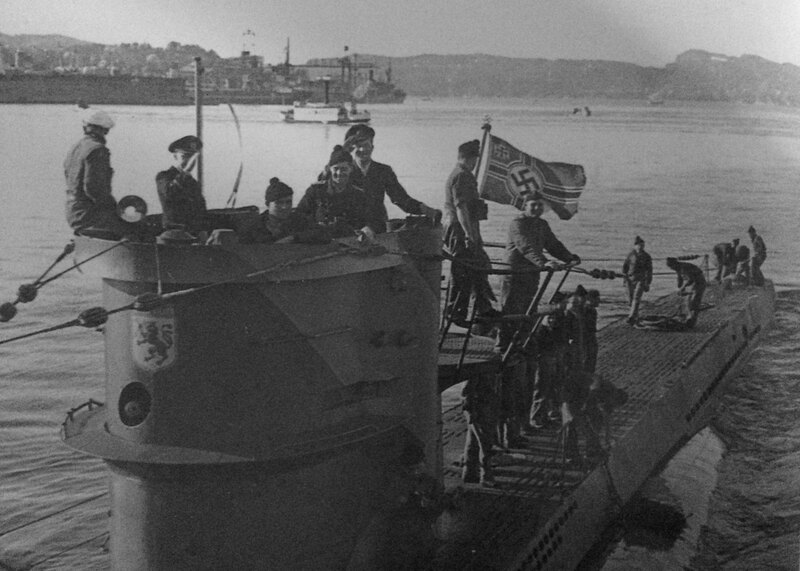 One of several recently released NOAA wartime photographs of U-576 and its crew that had been gathered by U-boat historian, Ed Caram, who died last year. Courtesy of NOAA. The World War I veterans are gone now, but the lingering effects and presence of that war are still remembered and felt today. The observance of the hundredth anniversary of the event that sparked the war—the assassination of the Austrian heir to the throne, Archduke Franz Ferdinand, on June 28th—took place this summer. As much as that older war is imbued in our history and culture, World War II looms larger not just because it was larger, but because it is still recent enough to be felt by the families of men who fought in it. 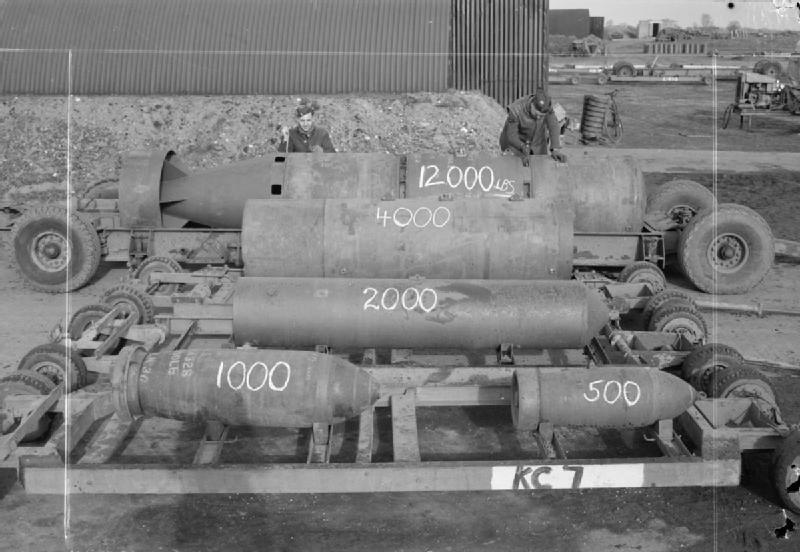 As enormous as the monetary cost of both wars was, the cost in lives—up to 16 million for WW I, and up to 80 million for WW II—was even more staggering. 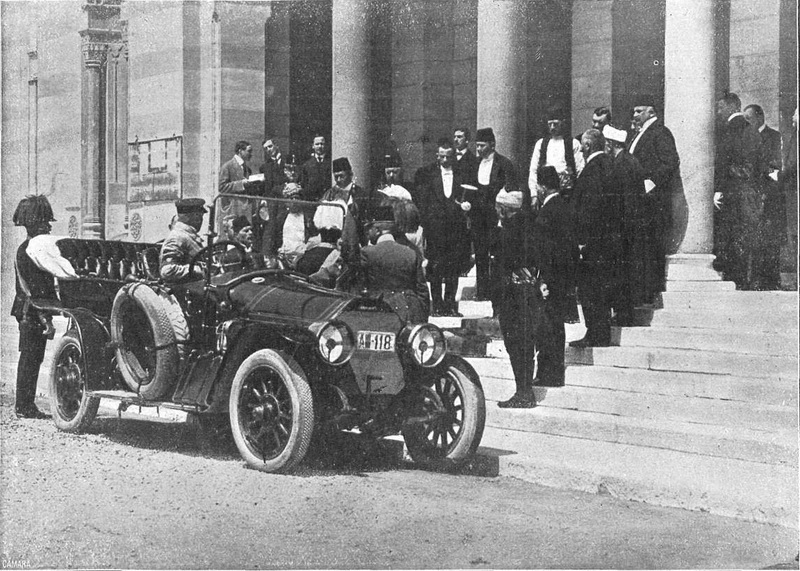 Minutes before the attack in Sarajevo that initiated WWI. This story has a dejecting part as well as something heroic and uplifting. Let’s get the cheerless part out of the way first. I don’t think about litter much until I’m on foot and see great quantities of it hidden in the grass of the roadside ditch. Or drive past piles of filled plastic bags after a cleanup effort. There’s a surprising amount of rubbish out there. I seldom see anyone throw anything from a car window like in the old days, yet somehow the garbage accumulates. Maybe litterers are more active after dark. A study or two has probably addressed this, but I’m getting off track. I can understand drinkers who drive, and underage occupants, throwing out their empties, but who and what accounts for all the other trash? Fortunately Washington state, where I live, isn’t the worst place when it comes to offenders. I suspect the reason has nothing to do with the intellect-challenged “Litter and it will hurt” signs along the roads. But again, I digress. Tired of North Korea and its sicko leader Kim Jong-un yet? One more post and then I’ll stop. This headline grabber is too barbaric to pass up—a report that Kim Jong-un machine-gunned his ex-lover and 11 other singers and performers accused of selling pornographic videos of themselves. Many news outlets picked up the story and disseminated it after South Korea’s Chosun Ilbo newspaper broke the story based on an unconfirmed report from China. The fact that a story like this is believable, even if it turns out to be a rumor, tells you all you need to know about this regime. When I saw the recent news story in the June 7 issue of The Week about a swimming pool study done in Atlanta by the Centers for Disease Control and Prevention, I read it with interest because I’ve often wondered why swimming in pools and lakes doesn’t cause more gastrointestinal illness. It’s hard not to ingest a bit of water whether you’re seriously swimming or just having fun. I know pools contain disinfectants that kill cryptosporidia and giardia (protozoans) and bacteria like E. coli, but disinfecting agents don’t work instantly. 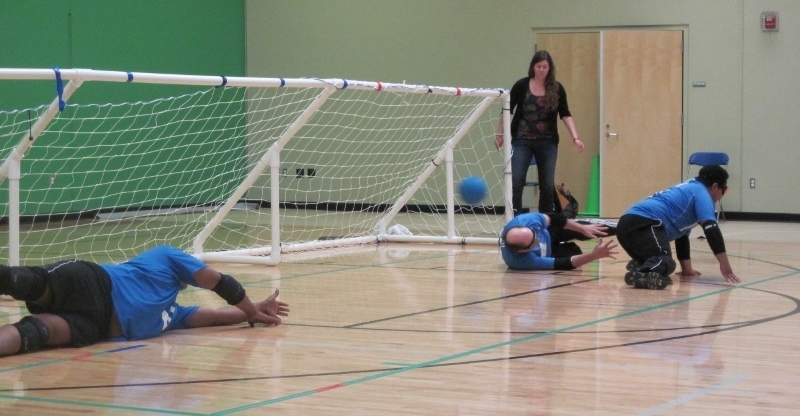 Heroes Shooting Blanks Pt. 2: Is there any location Hollywood hasn’t discovered? I’m beginning to think the answer to the question posed in my title is “no.” At least in the West within a thousand miles of LA. After leaving Movie Flats in the Alabama Hills, the lovely but surreal setting of the Trona Pinnacles became my next camping destination. The pinnacles are located on the playa of Searles Dry Lake in the Searles Valley, just one valley west of Death Valley National Park in this harsh basin and range country. 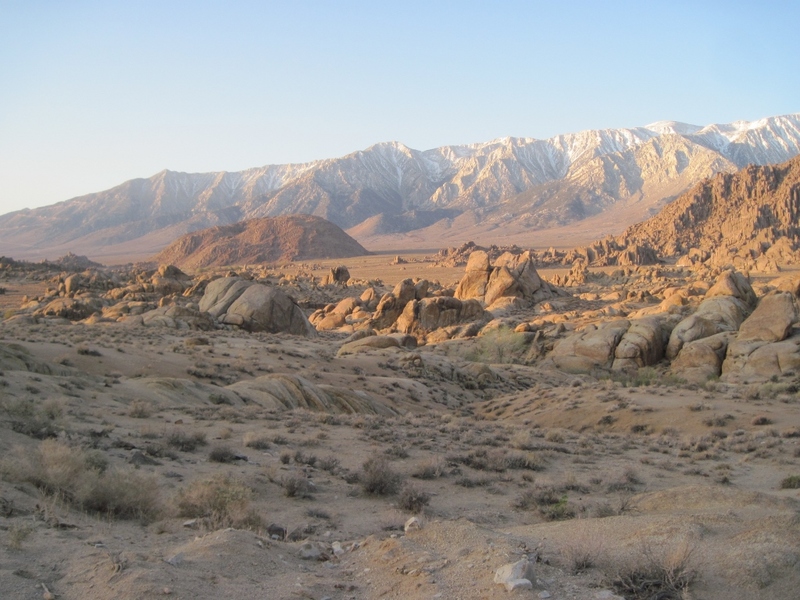 If you read my earlier post on the Bennett-Arcan wagon train party’s 1849 escape from Death Valley, it might interest you to know that another party became trapped in Death Valley about the same time. The Jayhawkers abandoned their wagons as well and walked out by way of Searles Valley. They acted to save themselves from a situation of their own making, so they were only heroes in a limited way. Yet even this marginal heroism beat what followed after this place too became a popular filming location, like Movie Flats. The cameras here weren’t shooting good guys shooting outlaws and Indians. The cinematography was of a different type. Our unmatched ability to conceive, make, and use tools is something that sets Homo sapiens apart from all other species. The use of tools is easy enough to picture in factories, repair shops, kitchens, and home workbenches, for the primary definition of the word is usually: an implement, especially one held in the hand, as a hammer, saw, or file, for performing or facilitating mechanical operations (dictionary.reference.com). But the definition of the word doesn’t stop there. Today the word is just as often used in a broader way: an item or implement used for a specific purpose. A tool can be …a technical object such as a web authoring tool or software program…a concept can also be considered a tool (businessdictionary.com). In other words, tools can also have intellectual components and be applied to intellectual pursuits. With humans being wired the way they are, progressive or competitive people are driven to devise or seek out the best possible tools. Let me now defer to a definition from a website for this type of person, Cool Tools. Its definition of a cool tool is: …anything useful that is superior to comparable items. The constant search for such tools is a component of, and a major driver of, science and technology. I am no longer a scientist, but the idea remains ingrained in me and I recognize that even selling books requires modern tools. Hence, the book trailer below. I won’t go so far as to claim it is the ultimate cool tool, but have a look! And Cool Tools is well worth a look, too. Yes, my new novel, Guy Going Under: A Cave Adventure, is now out there. It, like the bookshelf it rests on, is virtual and can be purchased as a Kindle eBook at Amazon.com. The paperback version should become available soon. As an adolescent, I was taken with Tom Sawyer’s cave adventure because I grew up near the Mississippi River in southeast Iowa, not too far north of Hannibal, Missouri. I suppose Mark Twain’s story first planted the idea of writing my own cave tale. Yes, it took me a few decades to make it happen, but I did do it. My tale is set in the Pacific Northwest rather than in the Midwest; Seattle plays a part, but most of the action takes place on Washington State’s Olympic Peninsula. Or maybe I should say under the Olympic Peninsula, since this a cave story. I’ll have a little more to say about the actual story in a follow-up post. 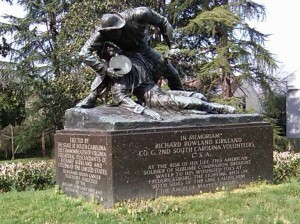 Richard Rowland Kirkland memorial at the Fredericksburg and Spotsylvania National Military Park. Photo by Eipert. Sasha Zaichik is the protagonist in this short novel, Breaking Stalin’s Nose, by Eugene Yelchin. Sasha is less a hero than an innocent victim, for what else can you call a ten-year old who’s been brought up with nothing but lies in a cynical, totalitarian state that maintains itself through fear and terror. Sorry. 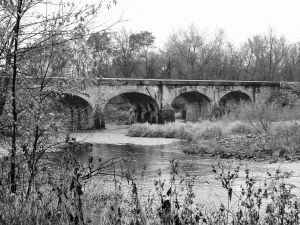 No heroes in this post, just a little more historical context to round out the Kate Shelley story. And I found some of it right in my own hometown.